Macrophage migration inhibitory factor (MIF) is a proinflammatory cytokine that has recently been implicated in carcinogenesis. Helicobacter pylori, which is closely linked to gastric cancer, induces the gastric epithelium to produce proinflammatory cytokines, including MIF. MIF can bind to CD74, which we have previously shown to be highly expressed on the surface of gastric epithelial cells (GEC) during H. pylori infection. In this study, we sought to investigate the role of the H. pylori-induced MIF on epithelial proliferation and procarcinogenic events. Upon establishing a role for the H. pylori CagA virulence factor in MIF production, MIF binding to CD74 on GEC was confirmed. rMIF and H. pylori were shown to increase GEC proliferation, which was decreased when cagA− strains were used and when CD74 was blocked by mAbs. Apoptosis was also decreased by MIF, but increased by cagA− strains that induced much lower amounts of MIF than the wild-type bacteria. Furthermore, MIF binding to CD74 was also shown to decrease p53 phosphorylation and up-regulate Bcl-2 expression. This data describes a novel system in which an H. pylori virulence factor contributes to the production of a host factor that in turn up-regulates procarcinogenic events by the gastric epithelium. Helicobacter pylori is a common human pathogen that infects over 50% of the world’s population. Infection with this organism is a major cause of chronic gastritis, gastric and duodenal ulcers, and gastric carcinomas throughout the world (1, 2). Pathogenesis of infection often includes inflammation, mucosal damage, or gastric atrophy, and requires close association of the bacteria with the gastric epithelium, leading to chronic epithelial responses. There is now considerable evidence linking this pathogen to changes in the gastric mucosa that contribute to gastric cancer (3, 4). Gastric cancer is the second leading cause of mortalities due to cancer in the world, is often undetectable in the early stages, and has an overall survival rate of only 10–20% (5). Links between chronic inflammation and carcinogenesis may play an important role in gastric cancer, but are not well understood. The main virulence factor of H. pylori that has been suggested to induce procarcinogenic events in gastric epithelial cells (GECs)3 is the cytotoxin-associated gene A product, CagA protein (6, 7). CagA is injected into cells by H. pylori’s type IV secretion system. Once CagA is injected into the cell, it specifically binds the Src homology 2-containing protein tyrosine phosphatase, SHP-2, in a tyrosine phosphorylation-dependent manner and stimulates phosphatase activity (8, 9). This activity induces various cell responses that result in cytoskeleton rearrangement leading to a cell scattering/hummingbird phenotype, and cell-to-cell disassociation that may result in disruption of the epithelial barrier integrity. ERK1/2 activation is also suggested to be induced after CagA is phosphorylated (10), and may also lead to increased inflammatory responses associated with H. pylori infection (11, 12). Another important observation about CagA+ H. pylori infections is an increase in gastric cell proliferation (13, 14), which has been observed both in vivo and in vitro. The mechanisms leading to this increase in proliferation remain unknown. H. pylori has recently been shown to induce production of macrophage migration inhibitory factor (MIF) by several cell types (15). MIF is a versatile cytokine that mediates both innate and adaptive immunity and plays a role in chronic inflammation. It has been shown to up-regulate NF-κB, ERK1/2, AP-1, and protein kinase C pathways leading to increased expression of IL-1β and IL-8 mRNA (16, 17). Also, it is important to consider the role that MIF plays in cell growth and procarcinogenic signaling. It is thought to promote tumor growth and viability by modulating immune responses and supporting tumor-associated angiogenesis (18, 19). The central mechanisms MIF affects to increase cell proliferation and decrease apoptosis are p53 inhibition and reduction of oxidative stress-induced apoptosis (20, 21). The inhibition of p53 appears to result in a more robust inflammatory response, which may also explain its importance in chronic inflammation. CD74, or the class II MHC-associated invariant chain, can act as a receptor for MIF (22). CD74 is known for its role in the regulation of intracellular transport and Ag-presenting functions of class II MHC molecules. Recent studies have shown that CD74 is not only expressed intracellularly, but also on a variety of cell surfaces, including GECs (23, 24). We and others have shown that bound CD74 can induce signaling events leading to NF-κB activation (25, 26). CD74 may also play a role in cancer. Cell surface expression of CD74 was shown to be up-regulated during gastric cancer when tumor cells were examined by immunohistochemical staining (27). Patients with low CD74 expression were shown to have better outcomes than those with high CD74 expression. In more general cancer immunotherapy studies, antisense suppression of CD74 has been demonstrated to be an effective therapeutic treatment in several studies (28, 29). This study investigated GEC production of MIF in response to H. pylori. This response was shown to be CagA dependent. MIF was shown to bind to CD74 in this system and increase cell proliferation that could be blocked by anti-CD74 mAbs. Cell proliferation was not increased by CagA knockout strains, but apoptosis rates of GECs were increased to levels that were higher than those of cells treated with wild-type H. pylori. Phosphorylated p53 was increased by CagA-deficient strains, but not by wild-type strains, and this increase was abrogated when rMIF was added to cell cultures suggesting that MIF induced by H. pylori infection decreases phosphorylation of p53, and increases GEC proliferation. These observations strongly suggest a link between MIF, a proinflammatory cytokine, and procarcinogenic events. The GEC line N87 (CRL-5822) was obtained from the American Tissue Culture Collection (ATCC) and maintained in RPMI 1640 medium supplemented with 10% FCS and 1 mM glutamine. The nontransformed fetal gastric cell line HS-738 (CRL-7869) was also obtained from ATCC and maintained in DMEM with high glucose, 10% FCS, and 1 mM glutamine. H. pylori strains 26695, a strain isolated from a patient with gastritis in the United Kingdom, and 51B, a strain isolated from a patient with gastritis in Japan, and the cagA isogenic mutants were obtained from Dr. Y. Yamaoka (Baylor College of Medicine, Houston, TX). These autonomous knockouts were prepared as previously described (30). All strains were grown on blood agar plates (BD Biosciences) at 37°C under microaerophilic conditions, as previously described (31). Bacteria were transferred after 48 h into Brucella broth containing 10% FBS for 24 h. After centrifugation at 2500 × g for 10 min, bacteria were resuspended in sterile PBS. The concentration of bacteria per milliliter was determined by measuring the OD530 using a spectrophotometer (DU-65; BD Biosciences) and comparing the value to a standard curve generated by quantifying viable organisms from aliquots of bacteria at varying concentrations that were also assessed by OD. H. pylori strains were incubated with GECs in a 100:1 bacteria:cell ratio in 24-well plates for 8-h time intervals up to 32 h. Supernatants from wells were used to quantitate the production of MIF by ELISA. The MIF ELISA kit was obtained from R&D Systems, and assays were performed according to the manufacturer’s instructions. rMIF (R&D Systems), 1 ng, was added to GEC lysates, and rotated for 2 h at 4°C. Lysate mixtures were precleared with 10 μl of protein A/G beads (Santa Cruz Biotechnology) for 2 h at 4°C. MIF was immunoprecipitated using protein A/G beads that were preincubated with anti-MIF mAb (R&D Systems) for 2 h at room temperature. After washing, beads were incubated with the lysate mixture of MIF and GEC lysates. Beads were then washed four times and the bound material was eluted, samples were run on SDS PAGE, and transferred to a nitrocellulose membrane for Western blotting. The membrane was incubated with the anti-CD74 Ab clone Pin.1 (StressGen Bioreagents at a 1/3,000 dilution for 2 h at room temperature. After washing four times for 15 min with TBS Tween 20, donkey anti-mouse HRP-conjugated secondary Ab (Santa Cruz Biotechnology) was used diluted 1/10,000 and incubated with the membrane for 1 h at room temperature. The membrane was again washed four times for 15 min. Immunoreactive proteins were detected using Super Signal West Pico Chemiluminescent Substrate (Pierce Biotechnologies). For flow cytometry, MIF was biotinylated using the Fluoreporter Biotinylation kit (Molecular Probes) according to manufacturer’s instructions. Biotinylated MIF (10 ng) was incubated with 2 × 105 GECs or fibroblast cells for 1 h at 4°C to prevent internalization. Some samples were incubated with the anti-CD74 mAb, MB-741 (BD Biosciences) for 1 h before exposure to MIF. After washing with PBS, samples were incubated with 1 μl of streptavidin-PE (BD Biosciences) for 30 min on ice. Samples incubated with only streptavidin-PE were used as the negative controls. Samples were washed two more times and analyzed by flow cytometry on a FACScan cytometer (BD Biosciences). CellTiter 96 Non-Radioactive Cell Proliferation kit (Promega) was used to measure cell proliferation. Cells were cultured in a 96-well plate overnight in serum-free medium at 1 × 104 cells/well. A standard curve was established using wells seeded with 1/2 dilutions of cells starting from 5 × 103 to 6.4 × 105. Cells were treated with 0.1, 1.0, or 10 ng/ml MIF or 1:1, 10:1, or 100:1 bacteria:cell ratio of wild-type and cag PAI or cagA knockout strains for 24 h. Some cells were pretreated with anti-CD74 clone MB-748 (BD Biosciences) or isotype control Abs before the addition of MIF. For a positive control, 1 ng/ml PMA was added to cells for 24 h. Cells were then washed with medium to remove bacteria, and the dye solution added according to manufacturer’s instructions for 1 h at 37°C. After addition of stop solution, OD was read at 490 nm using an ELISA plate reader. Cell numbers were calculated using the standard curve. Cell Death Detection ELISA (Roche) kits were used to measure cell death. Cells were treated with wild-type and cagA-deficient knockout strains using the same concentrations and time intervals that were used for proliferation assays. rMIF was added to some wells before cagA knockouts. For wild-type strains, anti-MIF neutralizing Abs were added to some wells and isotype controls were used as well. Cells were lysed according to the manufacturer’s instructions, lysates were used for ELISA, and OD was measured at 405 nm. Total and phosphorylated p53 levels were measured by intracellular bead arrays (BioSource International). Beads conjugated with mAbs for p53 were prepared according to manufacturer’s instructions and incubated with lysates from GECs treated with H. pylori strains 26695, 51B, or their CagA-deficient mutants for 24 h. Some samples were pretreated with rMIF (10 ng/ml) before the addition of H. pylori. After washing, samples were run on a Bio-Plex System and analyzed using Bio-Plex Manager software (Bio-Rad). Phosphorylated p53 was also detected by Western blotting. H. pylori strains or rMIF was incubated with GECs for 24 h. Cells were lysed as described previously (32). Lysates were centrifuged at 14,000 × g for 10 min at 4°C. The resulting protein (5 μg) from each sample were loaded into wells of 10% SDS gels for electrophoresis, and transferred to nitrocellulose membranes for Western blotting. The membranes were treated with incubated with anti-phospho (S15) p53 (R&D Systems), and anti-β-actin (Sigma-Aldrich) as a loading control. After washing four times for 15 min with TBS Tween, donkey anti-mouse HRP-conjugated secondary Ab (Santa Cruz Biotechnology) was used diluted 1/10,000 and incubated with the membrane for 1 h at room temperature. The membrane was again washed four times for 15 min. Immunoreactive proteins were detected using Super Signal West Pico Chemiluminescent Substrate (Pierce Biotechnologies). For flow cytometry analysis of Bcl-2 and activated caspase-3, cells were lysed using BD Cytofix/Cytoperm (BD Biosciences) according to the manufacturer’s instructions. Anti-Bcl-2 (BD Biosciences) or anti-caspase-3 active form (BD Biosciences), or isotype control (BD Biosciences) PE-conjugated Abs for 1 h on ice. Cells were washed with PBS and analyzed on the FACScan Flow Cytometer (BD Biosciences) using CellQuest software. Results are expressed as mean ± SEM. MIF production and cell turnover rates were compared using an ANOVA analysis of the variance and considered significant if p < 0.05. MIF has recently been suggested to play an important role in both innate and adaptive immunity and the dysregulation of cell cycle events in carcinogenesis. Because these factors are important during H. pylori infection, we sought to determine MIF production by GECs in response to H. pylori. Furthermore, because the cag pathogenicity island injection of CagA into cells plays such an important role in many GEC responses induced by H. pylori, cagA-deficient strains were compared with wild-type strains of H. pylori at a moderate infection of 10:1 bacteria:cell ratio. Fig. 1⇓, A and B, indicate that H. pylori strains 26695 and 51B induced MIF production by the HS-738 nontransformed fetal gastric cell line and the N87 gastric carcinoma cell line, respectively. Increases in MIF production were detected as early as 8 h postinfection and continued to increase up to 32 h after infection. 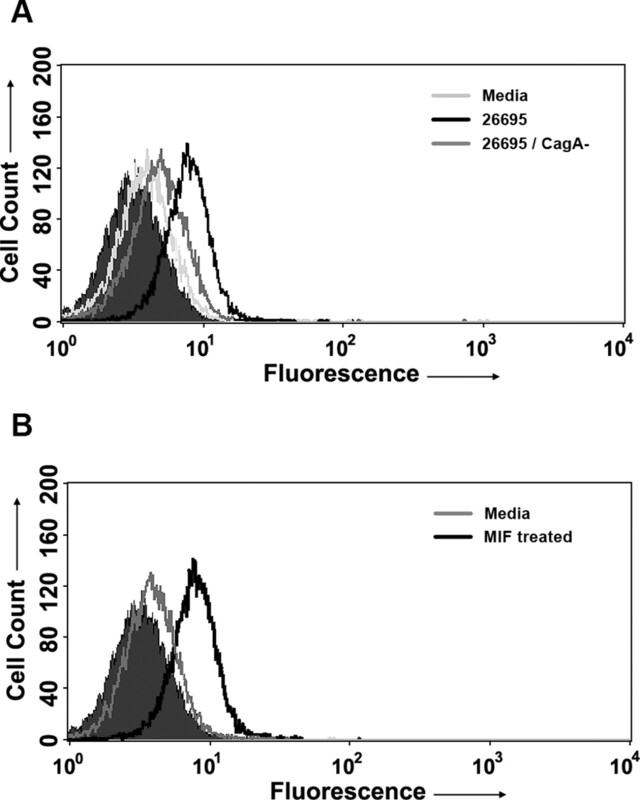 When the CagA-deficient strains were used at 24 h, the induction of MIF was just slightly above basal levels produced by both cell lines (Fig. 1⇓, C and D), whereas the wild-type (CagA+) induced a robust MIF response, suggesting that MIF production by GECs is dependent on CagA injection into the cells. GECs produce MIF in response to H. pylori. MIF production by (A) HS-738 and (B) N87 GECs after exposure to H. pylori strains 51B or 26695 for various time points assayed by ELISA. MIF levels were decreased when (C) HS-738 and (D) N87 cells where treated with CagA-deficient mutants compared with wild-type H. pylori at 24 h. The means are shown as the results of duplicates in four experiments, n = 8. CD74 has been suggested to act as a receptor for MIF in several studies (22, 33). We have shown that GECs express large amounts of CD74 (24, 25), which is up-regulated during inflammatory conditions and H. pylori infection (34). Consequently, we examined the role of CD74 as a receptor for MIF on GECs by immunoprecipitation and Western blot analysis. rMIF was incubated with N87 cell lysates. MIF was immunoprecipitated along with GEC proteins bound to it. 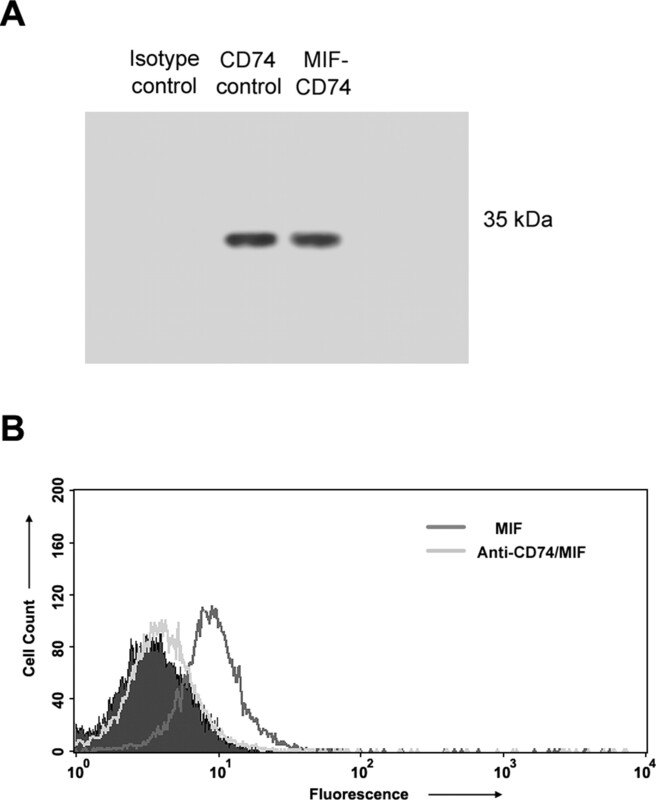 Western blot analysis using anti-CD74 mAbs revealed that CD74 was coprecipitated with MIF in samples and in control samples immunoprecipitated with anti-CD74 as indicated by the presence of a 33-kDa band (Fig. 2⇓A). MIF binds to CD74 on GECs. A, rMIF was mixed with N87 cell lysates and immunoprecipitated with anti-MIF Abs with bound cell proteins. Western blot analysis with anti-CD74 revealed the presence of CD74. N87 lysates were run as a control in the center lane, and N87 cell lysates immunoprecipitated with isotype control Abs were run in the left lane. B, Biotinylated rMIF was incubated with HS-738 cells and streptavidin-PE for flow cytometry. Anti-CD74 Abs blocked attachment to cells compared with the solid peak control. Attachment of MIF to CD74 was also analyzed by flow cytometry. Biotinylated MIF was incubated with GECs and stained with streptavidin-PE for analysis. As shown in Fig. 2⇑B, MIF attached to cells, but this attachment was dramatically decreased upon incubating cells with anti-CD74 before the addition of MIF. These studies suggest that CD74 is the primary receptor for MIF on GEC surfaces because blocking CD74 led to very little attachment of MIF to the cells. Various reports have shown that MIF increases proliferation of some cell types. In this study, we investigated the ability of MIF to induce proliferation of GECs. rMIF or H. pylori strains and their respective CagA-deficient knockout strains were incubated with cells for 24 h. Proliferation was measured by nonradioactive cell proliferation colorimetric assay, as used in multiple recent studies (14, 33). Standard curves of known amounts of cells were run with each assay to extrapolate cell number from treated samples. As seen in Fig. 3⇓A, GEC proliferation was increased starting at 0.1 ng/ml rMIF, which was in the range of that produced by GECs in response to H. pylori, and increased further with each 10-fold increase in MIF concentration. To investigate the role of CD74 in the observed proliferation, anti-CD74 blocking Abs were incubated with cells 30 min before addition of rMIF or H. pylori strains. CD74 blocking led to considerably decreased proliferation, at least 2-fold with high concentrations of MIF, than unblocked samples. Notably, after anti-CD74 treatment, proliferation levels were decreased to levels similar to those of untreated cells. MIF induces GEC proliferation. HS-738 and N87 cells were treated with (A) increasing concentrations of rMIF that led to increased proliferation (∗, p < 0.05), which is blocked using anti-CD74 compared with unblocked cells (∗∗, p < 0.05) (B) increasing ratios of H. pylori strain 26695 where all conditions showed significant increases in cell number (p < 0.05), (C) H. pylori strains 26695 and 51B increase proliferation compared with untreated cells (∗, p < 0.05), and their CagA-deficient knockouts led to decreased cell numbers compared with wild types (∗∗, p < 0.05) at 10 bacteria/cell and (D) anti-CD74 blocking Abs and anti-MIF neutralizing Abs decreased proliferation compared with unblocked cells (∗, p < 0.05). Cell proliferation was measured by CellTiter 96 Non-Radioactive Cell Proliferation kit and compared with a standard curve of known amounts of cells. The means are shown as the results of duplicates in four experiments, n = 8. To further investigate the role of MIF in H. pylori-induced GEC proliferation, wild-type and CagA-deficient strains were incubated with cells in ratios of 1:1, 10:1, and 100:1 bacteria:cells. Fig. 3⇑B demonstrates that H. pylori strain 26695 increases GEC proliferation at bacterial ratios of 1:1 and 10:1, but at 100:1 the cell number is decreased compared with 10:1, suggesting the cells are overwhelmed by bacteria and began to undergo apoptosis at higher concentrations. Based on these results, wild-type strains and CagA-deficient mutants were investigated at a 10:1 bacteria:cell ratio. Because the ability of H. pylori to induce MIF appeared to depend on cagA expression, to examine the effect of CagA on cell proliferation, CagA-deficient strains were used in these assays in comparison to wild-type strains. As shown in Fig. 3⇑C, CagA-deficient mutants induce proliferation to a lesser degree than wild-type strains. When anti-MIF neutralizing Abs were added to wells before the addition of wild-type H. pylori, proliferation was decreased by >50% (Fig. 3⇑D), further suggesting the role of MIF in H. pylori-induced cell proliferation. Because H. pylori is known to induce both cell proliferation and apoptosis (31, 35), apoptosis of GECs with wild-type H. pylori and CagA-deficient strains, which induce very little MIF, were investigated for their ability to induce apoptosis of GECs. Apoptosis was measured by Cell Death Detection ELISA for histone-associated DNA fragmentation (nucleosome fragment formation) at 24 and 48 h. Fig. 4⇓A indicates the apoptosis index of HS-738 cells in the presence of H. pylori 26695 in 1:1, 10:1, and 100:1 bacteria:cell ratios. Although apoptosis rates with the 10:1 bacteria:cell ratio was only slightly increased over that of 1:1, a much larger increase in apoptosis was observed with 100:1 bacteria:cell ratio, which parallels the decrease in proliferation seen with 100:1 in Fig. 3⇑B. When the 26695 CagA-deficient mutant strain was examined for its ability to induce GEC apoptosis, cell death was double of that induced by the wild-type, parental strain. Similar results were seen with strain 51B and its corresponding CagA-deficient mutant (data not shown here). To determine a role for MIF in the decreased apoptosis rates seen with wild-type H. pylori, rMIF (10 ng/ml) was added to cultures incubated with CagA-deficient strains in amounts equivalent to those produced during H. pylori 100:1 bacteria:cells (Fig. 1⇑). Addition of MIF to cultures with CagA-deficient mutants resulted in a decrease in apoptosis (Fig. 4⇓B), similar to that seen with wild-type 26695 in Fig. 4⇓A, demonstrating an important role for MIF in decreasing H. pylori-induced apoptosis. MIF decreases GEC apoptosis. HS-738 cells incubated with H. pylori 24 and 48 h were examined for apoptosis by histone-associated DNA fragmentation where (A) strain 26695 incubated with cells resulted in less DNA fragmentation than the CagA-deficient knockout (p < 0.05) and (B) CagA knockout DNA fragmentation was decreased with addition of rMIF (p < 0.05). The means are shown as the results of duplicates in four experiments, n = 8. Active caspase-3 was measured by flow cytometry as shown in example figures where (C) H. pylori strain 26695 induces some expression, which is increased with the CagA- strain and (D) reduced when rMIF is incubated with cells before infection in example figures compared with the isotype control shown with a solid peak when compared with solid peak isotype control. To further investigate the effect of MIF on apoptosis, expression of the activated form of caspase-3 was measured in GECs after exposure to 100:1 bacteria:cell ratio. Some cells were pretreated with 1 ng/ml rMIF for 24 h before exposure to H. pylori strains. As seen in Fig. 4⇑C, H. pylori induced cells to produce some active caspase-3, which was produced at a higher rate with the CagA-deficient bacteria than the wild type. When cells were pretreated with MIF before CagA− bacteria, the levels of active caspase-3 were decreased (Fig. 4⇑D), suggesting that MIF can down-regulate apoptotic events. MIF has been shown to decrease p53 expression and phosphorylation in several studies (36, 37). Because CagA has been shown here to induce MIF production by GECs, the role of rMIF and CagA-induced MIF in the expression and phosphorylation of p53 was investigated. The levels of total p53 and phosphorylated p53 (S15) were also measured by intracellular bead arrays. The units of phosphorylation per nanogram of total p53 were calculated as recommended by the manufacturer. Fig. 5⇓A illustrates that the level of phosphorylated p53 detected in cell treated with the CagA-deficient bacteria was more than double that of cells treated with the wild type, which was consistent with both strains tested. When rMIF was added to cells in similar amounts to that produced when cells were incubated with wild-type H. pylori before CagA− strains, the level of phospho-p53 was decreased to similar levels seen in cells treated with wild-type bacteria. To further verify these findings, Western blot analysis was performed with cell samples treated under the same conditions. Similarly, treating cells with CagA-deficient 26695 resulted in higher levels of phospho-p53 than those induced in cells treated with wild-type 26695 (Fig. 5⇓B). Similar results were seen with N87 cells and H. pylori strain 51B, but are not shown here. When rMIF was added, the levels of phosphorylated p53 decreased. These results, along with other studies suggesting a role for CagA in gastric cancer, and studies suggesting that MIF inhibits p53 function (36), indicate that MIF may play an important role in regulating p53 during H. pylori infections. p53 phosphorylation induction by H. pylori. Phosphorylation of p53 is shown with HS-738 cells by (A) intracellular bead array and (B) Western blotting where p53 phosphorylation is increased by H. pylori strain 26695 and 51B compared with untreated control (∗, p < 0.05), but increased more with the CagA− strain compared with 26695 (∗∗, p < 0.05), but decreased in the presence of rMIF (∗∗∗, p < 0.05). Because Bcl-2 expression is up-regulated during H. pylori infection and gastric atrophy and cancer (38, 39), and down-regulated in apoptotic cells (40), the expression of Bcl-2 was investigated during infection with H. pylori and upon pretreatment with rMIF. Flow cytometric analysis revealed that Bcl-2 expression is induced in GECs upon exposure to H. pylori, but is decreased when cells were exposed to CagA-deficient strains in comparison to wild-type strains (Fig. 6⇓A). Incubation of samples with rMIF alone also induced expression of Bcl-2 (Fig. 6⇓B). These results indicate that MIF may also play an important role in the induction of Bcl-2 expression seen in GECs during H. pylori infection. Bcl-2 expression by GECs. Bcl-2 staining in GECs is expressed (A) at higher levels with 26695 infection than with CagA− infection, but (B) increased when rMIF is incubated with cells in an example figure of HS-738 cells compared with the solid peak isotype control. Proinflammatory cytokines such as MIF and IL-8 have been attributed to increased proliferative signaling in a variety of systems (20, 33, 41, 42). MIF has been shown to play an important role in the regulation of proinflammatory immune responses in inflammatory disorders, and proliferative responses in multiple cancer types. MIF has recently been shown to be produced in response to H. pylori by multiple cell types (15). Because CagA has been shown to induce inflammatory responses (11, 12), and it has been associated with gastric cancer (43, 44), the role of CagA in MIF production by GECs was investigated in this study. By using CagA-deficient knockout strains, we established that CagA is responsible for MIF production by GECs because while wild-type strains induced MIF production, very little MIF was present in cultures treated with CagA knockout strains. GECs express CD74 and this expression increases during infection with H. pylori both in vivo and in vitro (24, 34). CD74 was recently shown to be used by MIF as a receptor (22). Consequently, MIF binding to CD74 on GECs was examined here, and found to be a major receptor for MIF in this system as well. Similar to MIF, CD74 has been shown to be up-regulated in cancer studies, including gastric cancer (27). In a previous study, we also found that CD74 surface expression is increased during inflammatory conditions, and during H. pylori infection (34). This is especially significant in this system because H. pylori can also use CD74 as a point of attachment to GECs (25). The dramatic increase in CD74 expression during infection and the high turnover rate of CD74 (22) suggests that both MIF and H. pylori can use CD74 as a receptor in this system. MIF binding to CD74 has been shown to increase proliferation of different cells types (22, 45, 46). Similarly, rMIF induced proliferation of GECs here in a dose-dependent fashion, and at comparable amounts to what is produced during H. pylori infection. Concurrently, H. pylori infection also led to increased proliferation, which was decreased when CagA knockout strains were used. Proliferation was also decreased when CD74 was blocked with Abs or MIF was neutralized by Abs in the medium. Under the same conditions, apoptosis of cells was decreased in the presence of MIF, and cagA knockout strains, where MIF production is much lower, induced greater levels of apoptosis than wild-type strains. rMIF added to cultures with the cagA knockout strains brought apoptosis levels back down suggesting that the effects MIF has on the cells may down-regulate apoptosis. The results of our studies agree with several other independent studies, including those by Peek et al. and Rokkas et al. (13, 14) using biopsies which showed that cag+ strains increase GEC proliferation without a parallel increase in apoptosis. However, a separate study by Moss et al. (47) disagreed with these and suggested that there is not a deficiency in apoptosis with cagA+ strains, but the authors of this study also proposed that host factors may be more important than bacterial factors in determining the outcome of infection. Our studies agree that a host factor, MIF, may be crucial in shifting the balance of proliferation/apoptosis to one that is more positive for proliferation. Concurrent with the decrease in apoptosis attributed to MIF, MIF may inhibit p53 function (36, 37), which is considered an important tumor suppressor because it is an important factor in apoptotic pathways. As for the effect of H. pylori on p53, there is conflicting information available. Several studies suggest there are no changes in p53 levels of the gastric mucosa during infection (48, 49), while others suggest that p53 levels are increased during infection (50, 51). However, these studies only looked at total p53 present, but failed to investigate levels of phosphorylated p53. In this study, we measured the amount of phosphorylated p53 per nanogram of total p53. We found that the total amount of p53 did not fluctuate much during infection, but there were changes in phosphorylated p53. Although wild-type H. pylori did induce some phosphorylation of p53, CagA-deficient strains induced more than double the levels. The addition of rMIF decreased these levels to levels similar to those induced by the wild-type bacteria. Based on these studies, MIF appears to have the ability to decrease p53 phosphorylation, which may elucidate how it decreases apoptosis. There are certainly bacterial factors present that induce some p53 phosphorylation, as seen with wild-type H. pylori, but MIF appears to decrease the overall amount of phosphorylation, and apoptosis seen. This is especially evident with cells infected with CagA-deficient strains along with rMIF. Because H. pylori has also been proposed to mutate p53, the possibility that MIF may be involved should also be investigated. To further examine the role for MIF in the regulation of apoptosis and increased proliferation, Bcl-2 expression by infected GECs was investigated. Bcl-2 regulates apoptotic processes, and can lead to apoptotic resistance when highly expressed. This protein has been shown to be up-regulated during H. pylori infection with cag+ strains (52) and H. pylori-associated gastric cancers (38, 39). In this study, Bcl-2 levels were expressed at much higher levels in GECs with wild-type strains than with CagA-deficient strains. rMIF was also able to increase expression further suggesting the role for MIF in driving cells toward a carcinogenic phenotype. The data presented here are the first to suggest a crucial role for MIF in the procarcinogenic signaling induced by H. pylori infection of GECs. Production of MIF by these cells in response to H. pylori depends upon the presence of CagA, which is also the bacterial factor suggested to play a role in procarcinogenic epithelial responses. rMIF induced the same proliferative responses that CagA+ H. pylori strains, and could therefore be an important piece to the gastric cancer puzzle. We thank Dr. Yoshio Yamaoka for providing the H. pylori strains used in these studies. ↵1 This work was supported by the National Institutes of Health Grants DK50669 and DK56338. E.J.B. was a recipient of a fellowship under National Institutes of Health Training Grant T32 AI007536-06. ↵3 Abbreviations used in this paper: GEC, gastric epithelial cell; MIF, macrophage migration inhibitory factor. Dunn, B. E., H. Cohen, M. J. Blaser. 1997. Helicobacter pylori. Clin. Microbiol. Rev. 10: 720-741. Kuipers, E. J.. 1997. Helicobacter pylori and the risk and management of associated diseases: gastritis, ulcer disease, atrophic gastritis and gastric cancer. Aliment. Pharmacol. Ther. 11: (Suppl. 1):71-88. Bjorkholm, B., P. Falk, L. Engstrand, O. Nyren. 2003. Helicobacter pylori: resurrection of the cancer link. J. Intern. Med. 253: 102-119. Uemura, N., S. Okamoto, S. Yamamoto. 2002. H. pylori infection and the development of gastric cancer. Keio. J. Med. 51: (Suppl. 2):63-68. Msika, S., M. A. Tazi, A. M. Benhamiche, C. Couillault, M. Harb, J. Faivre. 1997. Population-based study of diagnosis, treatment and prognosis of gastric cancer. Br. J. Surg. 84: 1474-1478. Deguchi, R., A. Takagi, H. Kawata, H. Inoko, T. Miwa. 2001. Association between CagA+ Helicobacter pylori infection and p53, bax and transforming growth factor-β-RII gene mutations in gastric cancer patients. Int. J. Cancer 91: 481-485. Farinati, F., R. Cardin, V. M. Russo, G. Busatto, M. Franco, M. Rugge. 2003. Helicobacter pylori CagA status, mucosal oxidative damage and gastritis phenotype: a potential pathway to cancer?. Helicobacter 8: 227-234. Higashi, H., R. Tsutsumi, S. Muto, T. Sugiyama, T. Azuma, M. Asaka, M. Hatakeyama. 2002. SHP-2 tyrosine phosphatase as an intracellular target of Helicobacter pylori CagA protein. Science 295: 683-686. Yamazaki, S., A. Yamakawa, Y. Ito, M. Ohtani, H. Higashi, M. Hatakeyama, T. Azuma. 2003. The CagA protein of Helicobacter pylori is translocated into epithelial cells and binds to SHP-2 in human gastric mucosa. J. Infect. Dis. 187: 334-337. Higashi, H., A. Nakaya, R. Tsutsumi, K. Yokoyama, Y. Fujii, S. Ishikawa, M. Higuchi, A. Takahashi, Y. Kurashima, Y. Teishikata, et al 2004. Helicobacter pylori CagA induces Ras-independent morphogenetic response through SHP-2 recruitment and activation. J. Biol. Chem. 279: 17205-17216. Crabtree, J. E., S. M. Farmery. 1995. Helicobacter pylori and gastric mucosal cytokines: evidence that CagA-positive strains are more virulent. Lab. Invest. 73: 742-745. Peek, R. M., Jr, G. G. Miller, K. T. Tham, G. I. Perez-Perez, X. Zhao, J. C. Atherton, M. J. Blaser. 1995. Heightened inflammatory response and cytokine expression in vivo to cagA+ Helicobacter pylori strains. Lab. Invest. 73: 760-770. Peek, R. M., Jr, S. F. Moss, K. T. Tham, G. I. Perez-Perez, S. Wang, G. G. Miller, J. C. Atherton, P. R. Holt, M. J. Blaser. 1997. Helicobacter pylori cagA+ strains and dissociation of gastric epithelial cell proliferation from apoptosis. J. Natl. Cancer Inst. 89: 863-868. Rokkas, T., S. Ladas, C. Liatsos, E. Petridou, G. Papatheodorou, S. Theocharis, A. Karameris, S. Raptis. 1999. Relationship of Helicobacter pylori CagA status to gastric cell proliferation and apoptosis. Dig. Dis. Sci. 44: 487-493. Xia, H. H., S. K. Lam, A. O. Chan, M. C. Lin, H. F. Kung, K. Ogura, D. E. Berg, B. C. Wong. 2005. Macrophage migration inhibitory factor stimulated by Helicobacter pylori increases proliferation of gastric epithelial cells. World J. Gastroenterol. 11: 1946-1950. Onodera, S., J. Nishihira, Y. Koyama, T. Majima, Y. Aoki, H. Ichiyama, T. Ishibashi, A. Minami. 2004. Macrophage migration inhibitory factor up-regulates the expression of interleukin-8 messenger RNA in synovial fibroblasts of rheumatoid arthritis patients: common transcriptional regulatory mechanism between interleukin-8 and interleukin-1β. Arthritis Rheum. 50: 1437-1447. Ren, Y., H. M. Chan, Z. Li, C. Lin, J. Nicholls, C. F. Chen, P. Y. Lee, V. Lui, M. Bacher, P. K. Tam. 2004. Upregulation of macrophage migration inhibitory factor contributes to induced N-Myc expression by the activation of ERK signaling pathway and increased expression of interleukin-8 and VEGF in neuroblastoma. Oncogene 23: 4146-4154. Chesney, J., C. Metz, M. Bacher, T. Peng, A. Meinhardt, R. Bucala. 1999. An essential role for macrophage migration inhibitory factor (MIF) in angiogenesis and the growth of a murine lymphoma. Mol. Med. 5: 181-191. Nishihira, J., T. Ishibashi, T. Fukushima, B. Sun, Y. Sato, S. Todo. 2003. Macrophage migration inhibitory factor (MIF): its potential role in tumor growth and tumor-associated angiogenesis. Ann. NY Acad. Sci. 995: 171-182. Mitchell, R. A., C. N. Metz, T. Peng, R. Bucala. 1999. Sustained mitogen-activated protein kinase (MAPK) and cytoplasmic phospholipase A2 activation by macrophage migration inhibitory factor (MIF): regulatory role in cell proliferation and glucocorticoid action. J. Biol. Chem. 274: 18100-18106. Nguyen, M. T., H. Lue, R. Kleemann, M. Thiele, G. Tolle, D. Finkelmeier, E. Wagner, A. Braun, J. Bernhagen. 2003. The cytokine macrophage migration inhibitory factor reduces pro-oxidative stress-induced apoptosis. J. Immunol. 170: 3337-3347. Leng, L., C. N. Metz, Y. Fang, J. Xu, S. Donnelly, J. Baugh, T. Delohery, Y. Chen, R. A. Mitchell, R. Bucala. 2003. MIF signal transduction initiated by binding to CD74. J. Exp. Med. 197: 1467-1476. Ong, G. L., D. M. Goldenberg, H. J. Hansen, M. J. Mattes. 1999. Cell surface expression and metabolism of major histocompatibility complex class II invariant chain (CD74) by diverse cell lines. Immunology 98: 296-302. Barrera, C. A., E. J. Beswick, J. C. Sierra, D. Bland, R. Espejo, R. Mifflin, P. Adegboyega, S. E. Crowe, P. B. Ernst, V. E. Reyes. 2005. Polarized expression of CD74 by gastric epithelial cells. J. Histochem. Cytochem. 53: 1481-1489. Beswick, E. J., D. A. Bland, G. Suarez, C. A. Barrera, X. Fan, V. E. Reyes. 2005. Helicobacter pylori binds to CD74 on gastric epithelial cells and stimulates interleukin-8 production. Infect. Immun. 73: 2736-2743. Matza, D., O. Wolstein, R. Dikstein, I. Shachar. 2001. Invariant chain induces B cell maturation by activating a TAF(II)105-NF-κB-dependent transcription program. J. Biol. Chem. 276: 27203-27206. Ishigami, S., S. Natsugoe, K. Tokuda, A. Nakajo, H. Iwashige, K. Aridome, S. Hokita, T. Aikou. 2001. Invariant chain expression in gastric cancer. Cancer Lett. 168: 87-91. Lu, X., N. L. Kallinteris, J. Li, S. Wu, Y. Li, Z. Jiang, G. G. Hillman, J. V. Gulfo, R. E. Humphreys, M. Xu. 2003. Tumor immunotherapy by converting tumor cells to MHC class II-positive, Ii protein-negative phenotype. Cancer Immunol. Immunother. 52: 592-598. Xu, M., X. Lu, N. L. Kallinteris, Y. Wang, S. Wu, E. von Hofe, J. V. Gulfo, R. E. Humphreys, G. G. Hillman. 2004. Immunotherapy of cancer by antisense inhibition of Ii protein, an immunoregulator of antigen selection by MHC class II molecules. Curr. Opin. Mol. Ther. 6: 160-165. Yamaoka, Y., D. H. Kwon, D. Y. Graham. 2000. A Mr 34,000 proinflammatory outer membrane protein (oipA) of Helicobacter pylori. Proc. Natl. Acad. Sci. USA 97: 7533-7538. Fan, X., S. E. Crowe, S. Behar, H. Gunasena, G. Ye, H. Haeberle, N. Van Houten, W. K. Gourley, P. B. Ernst, V. E. Reyes. 1998. The effect of class II major histocompatibility complex expression on adherence of Helicobacter pylori and induction of apoptosis in gastric epithelial cells: a mechanism for T helper cell type 1-mediated damage. J. Exp. Med. 187: 1659-1669. Fan, X. G., D. Kelleher, X. J. Fan, H. X. Xia, P. W. Keeling. 1996. Helicobacter pylori increases proliferation of gastric epithelial cells. Gut 38: 19-22. Beswick, E. J., S. Das, I. V. Pinchuk, P. Adegboyega, G. Suarez, Y. Yamaoka, V. E. Reyes. 2005. Helicobacter pylori-induced IL-8 production by gastric epithelial cells up-regulates CD74 expression. J. Immunol. 175: 171-176. Peek, R. M., Jr. 2002. Helicobacter pylori strain-specific modulation of gastric mucosal cellular turnover: implications for carcinogenesis. J. Gastroenterol. 37: (Suppl. 13):10-16. Mitchell, R. A., H. Liao, J. Chesney, G. Fingerle-Rowson, J. Baugh, J. David, R. Bucala. 2002. Macrophage migration inhibitory factor (MIF) sustains macrophage proinflammatory function by inhibiting p53: regulatory role in the innate immune response. Proc. Natl. Acad. Sci. USA 99: 345-350. Fingerle-Rowson, G., O. Petrenko, C. N. Metz, T. G. Forsthuber, R. Mitchell, R. Huss, U. Moll, W. Muller, R. Bucala. 2003. The p53-dependent effects of macrophage migration inhibitory factor revealed by gene targeting. Proc. Natl. Acad. Sci. USA 100: 9354-9359. Topal, D., V. Goral, F. Yilmaz, I. H. Kara. 2004. The relation of Helicobacter pylori with intestinal metaplasia, gastric atrophy and BCL-2. Turk. J. Gastroenterol. 15: 149-155. Zhang, H., D. C. Fang, R. Q. Wang, S. M. Yang, H. F. Liu, Y. H. Luo. 2004. Effect of Helicobacter pylori infection on expression of Bcl-2 family members in gastric adenocarcinoma. World J. Gastroenterol. 10: 227-230. Chu, S. H., J. W. Lim, K. H. Kim, H. Kim. 2003. NF-κB and Bcl-2 in Helicobacter pylori-induced apoptosis in gastric epithelial cells. Ann. NY Acad. Sci. 1010: 568-572. Li, A., M. L. Varney, J. Valasek, M. Godfrey, B. J. Dave, R. K. Singh. 2005. Autocrine role of interleukin-8 in induction of endothelial cell proliferation, survival, migration and MMP-2 production and angiogenesis. Angiogenesis 8: 63-71. Joh, T., H. Kataoka, S. Tanida, K. Watanabe, T. Ohshima, M. Sasaki, H. Nakao, H. Ohhara, S. Higashiyama, M. Itoh. 2005. Helicobacter pylori-stimulated interleukin-8 (IL-8) promotes cell proliferation through transactivation of epidermal growth factor receptor (EGFR) by disintegrin and metalloproteinase (ADAM) activation. Dig. Dis. Sci. 50: 2081-2089. Al Marhoon, M. S., S. Nunn, R. W. Soames. 2004. The association between cagA+ H. pylori infection and distal gastric cancer: a proposed model. Dig. Dis. Sci. 49: 1116-1122. Azuma, T., S. Yamazaki, A. Yamakawa, M. Ohtani, A. Muramatsu, H. Suto, Y. Ito, M. Dojo, Y. Yamazaki, M. Kuriyama, et al 2004. Association between diversity in the Src homology 2 domain-containing tyrosine phosphatase binding site of Helicobacter pylori CagA protein and gastric atrophy and cancer. J. Infect. Dis. 189: 820-827. Meyer-Siegler, K. L., R. C. Ordorica, P. L. Vera. 2004. Macrophage migration inhibitory factor is upregulated in an endotoxin-induced model of bladder inflammation in rats. J. Interferon Cytokine Res. 24: 55-63. Moss, S. F., E. M. Sordillo, A. M. Abdalla, V. Makarov, Z. Hanzely, G. I. Perez-Perez, M. J. Blaser, P. R. Holt. 2001. Increased gastric epithelial cell apoptosis associated with colonization with cagA+ Helicobacter pylori strains. Cancer Res. 61: 1406-1411. Peek, R. M., Jr, M. J. Blaser, D. J. Mays, M. H. Forsyth, T. L. Cover, S. Y. Song, U. Krishna, J. A. Pietenpol. 1999. Helicobacter pylori strain-specific genotypes and modulation of the gastric epithelial cell cycle. Cancer Res. 59: 6124-6131. Berloco, P., F. Russo, F. Cariola, M. Gentile, P. Giorgio, M. L. Caruso, A. M. Valentini, G. Di Matteo, A. Di Leo. 2003. Low presence of p53 abnormalities in H. pylori-infected gastric mucosa and in gastric adenocarcinoma. J. Gastroenterol. 38: 28-36. Hibi, K., H. Mitomi, W. Koizumi, S. Tanabe, K. Saigenji, I. Okayasu. 1997. Enhanced cellular proliferation and p53 accumulation in gastric mucosa chronically infected with Helicobacter pylori. Am. J. Clin. Pathol. 108: 26-34. Kodama, M., T. Fujioka, K. Murakami, T. Okimoto, R. Sato, K. Watanabe, M. Nasu. 2005. Eradication of Helicobacter pylori reduced the immunohistochemical detection of p53 and MDM2 in gastric mucosa. J. Gastroenterol. Hepatol. 20: 941-946. Choi, I. J., J. S. Kim, J. M. Kim, H. C. Jung, I. S. Song. 2003. Effect of inhibition of extracellular signal-regulated kinase 1 and 2 pathway on apoptosis and bcl-2 expression in Helicobacter pylori-infected AGS cells. Infect. Immun. 71: 830-837.